Producer Charlotte Mangin and director Gini Reticker discuss their May 2006 shoot in Morocco for the making of “Class of 2006”. Director Gini Reticker and translator Jalila Otky talk with the women at the religious academy in Rabat, Morocco, minutes after they receive their final exam results. During my honeymoon in Tangier in the summer of 2004, the Moroccan press was abuzz with news of King Mohammed VI’s progressive new family law. Granting women equal rights in marriage, divorce, and the ownership of property, it was hailed as a revolutionary step toward women’s empowerment in the Arab world. My chance to gain a deeper understanding into the changing lives of Muslim women came two years later in the form of unlikely pioneers: a class of 50 pious women — the first in Morocco to be officially trained as religious leaders. WIDE ANGLE immediately appreciated the uniqueness of this story and helped me assemble a top-notch all-women crew. Gini Reticker, the director, who has focused her career on films about women’s issues, including WIDE ANGLE’s Emmy Award-winning “Ladies First” about women re-building Rwanda in the aftermath of the genocide; Kirsten Johnson, the cinematographer, who was overjoyed to travel to Morocco as she happened to be putting the finishing touches on a screenplay about a love story between a Moroccan and an American; and Judy Karp, the sound recordist, whose sense of humor, we soon learned, would keep us laughing through every production glitch. I have spent most of the past year developing a project on American Muslim women with producer David Bolt. So when I got the call from WIDE ANGLE asking if I would be interested in covering the training of women as religious leaders in Morocco, I jumped at the opportunity. With only two weeks lead time before departure, I literally buried myself in research, reading everything and anything I could get my hands on. I was instantly intrigued. A young, seemingly hip King — the son of an authoritarian ruler — was spearheading this initiative? A feminist movement that had been active for decades in a Muslim country? An Islamist movement, opposed to the feminists, with a dynamic woman as its spokesperson? Clearly the story defied stereotype. I was excited to work with Charlotte, thrilled that her French is fluent and grateful that she had uncovered such a dynamite story. Kirsten Johnson and I would be teaming up again for our third time in Africa together. It had been years since Judy Karp and I had worked together. Charlotte had lined up an ace production company in Rabat, Moroccan Press Network (MPN). They would prove invaluable in helping us navigate the endless bureaucracy, providing simultaneous Arabic interpreting and deciphering the system. Our original plan was to follow 3 or 4 of the women from graduation to their first few weeks on the job, as they fanned out to mosques, schools, hospitals, and prisons in varying locations around the country. In late April 2006, our permission to shoot came through less than a week before the women’s historic graduation ceremony. We scrambled to get out the door. Upon landing in Rabat, the Ministry of Islamic Affairs — which oversees the women’s training — affirmed its enthusiasm for our project. On May 3rd, 2006 — graduation day — we arrived at the religious academy to discover a group of women sitting around a fountain in a classic tiled courtyard, nervously awaiting the results of their final exams. We spoke to as many of them as possible, quickly casting potential characters as we jotted down their names and basic biographies. It was, to our jetlagged eyes, hard at first to tell these veiled women apart, so we referred to them among ourselves by the colors of their veils: pink, light green, striped black and white, leopard spotted — a real fashion show. By the end of the day, over 20 of the women — out of the 50 who passed their finals — expressed interest in participating in our documentary. One of them, Samira Marzouk, a vibrant 29 year-old, insisted on inviting us to her home for breakfast the following morning. Little did we know at the time that she would become the main character in the film. Producer Charlotte Mangin and translator Houssna Choukry don the hijab, or veil, to enter into a mosque. Graduation day was a whirlwind. Our crew found themselves caught up in the national and international press frenzy that mobbed the women on their big day, jazzed to report on a story that flew in the face of stereotypes about submissive Muslim women. The 150 men who graduated alongside the women, though photogenic in their white robes and red Fez hats, were meanwhile left on the side-lines. We all felt a great sense of relief and accomplishment after the first two days of shooting. Kirsten and Judy had done an amazing job of walking off a plane into a grueling shoot. I felt confident that out of the 20 women who were interested in taking part in the documentary, we would be able to follow at least three, if not four, of the women over the next few weeks. In the following days, one by one the women backed out. Some cited their parents or husbands who wouldn’t agree to let them be filmed, others worried about sensitivities surrounding their role and mission. The delicate nature of the story was brought home to us in all its complexity. The training program of the religious guides is not solely a step toward advancing women’s rights in Morocco by giving them an official voice in the mosque; it also fits into a larger political strategy to combat the rise of fundamentalism in the country. By training women to preach a tolerant brand of Islam, in keeping with Morocco’s open-minded Sufi traditions, the Ministry of Islamic Affairs hopes they will counteract more extremist or even Wahhabi doctrines that have seeped into the country in recent decades. We all found ourselves struggling with preconceived ideas. About 80% of the women in Morocco wear the headscarf, or hijab. Women like Samira and the women we met at the religious school wear it proudly, without a hint of submission. Other women we met, like our translators, were dressed much the same as we were. The latter talked about feeling increasing pressure to don the hijab and about the growing presence of religious lectures at traditional family affairs. They were alarmed that a number of male friends that they had gone to school with suddenly wouldn’t shake their hands anymore. Press reports echoed throughout the world celebrating the women as the vanguard of Morocco’s fight against extremism. Within days, the Ministry of Islamic Affairs, upset at the political nature of the coverage, called to forbid our crew from pursuing interviews with the women from the program, claiming they had not been trained to answer policy questions and essentially asking us to abort our shoot. “Come back in 5 or 6 months once things have settled down and we can take stock of the women’s impact,” the cabinet chief of the Ministry instructed us. While we would have welcomed the luxury of making this documentary over the course of many months, the realities of production (including a July 2006 airdate) prevented us from coming home with only a partial film. We began a drawn-out campaign of faxes, phone calls, and meetings to try to reach a compromise with the Ministry about access to the women’s lives. As an independent filmmaker, my first instinct was to defy the Ministry’s request and pursue interviewing the few women who were still expressing an interest in participating in the documentary. I decided that we should continue, as planned, on our journey to film with one of them, Houria Ben Kada, in the remote desert town of Bouarfa, near the Algerian border. Given that over 100,000 people have died in civil war with Islamists in Algeria in the last 20 years, I knew the border area was sensitive. That made the story all the more interesting to me. Once we arrived, we went to introduce ourselves to Houria’s Berber family. Her father, Omar, went to check on our film permit. The all-women crew stayed behind and met with Houria, her mother and her sister. It was one of the most moving nights of the trip. Charlotte introduced all of us, mentioning that Kirsten and I had made “Ladies First” for WIDE ANGLE in Rwanda two years ago. It gave us the opportunity to tell them about the extraordinary experience of meeting Rwandan women who were willing to overcome horrific atrocities to work with the wives of the perpetrators to build a future for their children. There is no doubt in my mind that Houria, her mother and her sister all shared the idea that women had a key role to play in creating peace. We sensed we had found a common language. 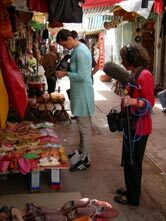 Cinematographer Kirsten Johnson and sound recordist Judy Karp capture the sights and sounds of the street market, or souk, in the old city of Rabat, Morocco. At that moment, Houria’s father returned. His mood had changed from welcoming to impatient. He seemed to be both asking us to leave immediately and to come back for a huge feast in our honor the following day. After leaving, I felt unsure of how to proceed. Since meeting the family, neither I nor the crew were comfortable pursuing an interview with Houria. We realized we could endanger her job. It was late Friday night. We tried unsuccessfully to reach the Minister’s office. We went to bed uncertain what we would do the next day. In the morning, I decided to forget about the interview with Houria and interview her parents instead. Both were children of polygamists, both had lived as nomads growing up, and both agreed to the interview. We spend the day drinking mint tea with their extended family and eating a goat slowly cooked on a spit and served whole, with head and legs and tail attached. It was a high honor, reserved to guests from far away. And succulent. In the morning, as we head back to Rabat, we realized that there was no way to move forward without the permission of the Minister. Meanwhile, we turned our camera to the bigger picture of the status of women in Morocco. We filmed Rajaa Naji El Mekkaoui, who created the curriculum for the religious academy, and was the first woman in Moroccan history to deliver a televised lecture on religious matters before the king and his court. We also decided to profile two very strong women on opposite sides of the political spectrum: Fouzia Assouli, a feminist who has been fighting to liberate women for decades, and Nadia Yassine, spokeswoman of Justice and Charity, Morocco’s most popular opposition movement, who advocates the establishment of an Islamic state. We set about capturing the contradictions of Moroccan society: veiled mothers walking with teens in mini-skirts; modern shopping malls selling the latest electronic gadgets steps away from the colorful market stalls of the old city, hawking spices and traditional medicines; satellite dishes dotting the roofs of slum dwellings in the shantytowns; the call to prayer resounding off rooftops every few hours, melding into the rhythm and bustle of daily life. Everywhere we went, we were greeted by unparalleled Moroccan hospitality, which usually revolved around eating. The ritual pouring of sweet mint tea, the pyramids of dates and cookies, the bricks of goat cheese. It was a feast in every home. Samira and her family insisted on inviting us for a traditional Friday lunch, Moroccan style: couscous. We gathered shoulder to shoulder around a huge plate piled high with layers of buttery couscous grains, steamed vegetables, and a whole chicken. Digging in with our spoons, we ate the plate clean. As we ate our way through Morocco, we continued to work on getting permission from the Minister to profile other women. We were running out of time. I did wrangle a meeting with the Minister where he agreed to an on-camera interview. Lucky for us, too, as the interview turned out be a major spine of the documentary! The day before our departure, we got a surprise call from Samira: her employment papers had arrived. The Ministry granted us one final permission to shoot her first visit to her new mosque. 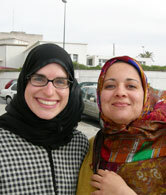 Kirsten and I dressed in headscarves and followed along for Samira’s hour-long commute. We found a construction site (the mosque is working to enlarge the women’s section) and a group of effusive old women. When Samira explained the presence of the camera to them and that I had good intentions, the women proceeded to hug me and kiss my hands and praise Allah, misinterpreting it to mean that I was thinking about converting to Islam. We ended up feeling that for the women religious leaders, as well as for the country as a whole, it was an incredible moment of both opportunity and peril.